Much to the surprise of many this afternoon, Danny began to take in a big o’ gulp of slightly drier air likely from the south. As of 5pm, winds were still 50 mph. A quick look at precipitable water or water vapor imagery reveals a temporary tear in the umbilical cord located just west of 40°W. In the images below, that drier air appears to have gotten sucked in not once but twice. Once just before this loop, and again late afternoon. 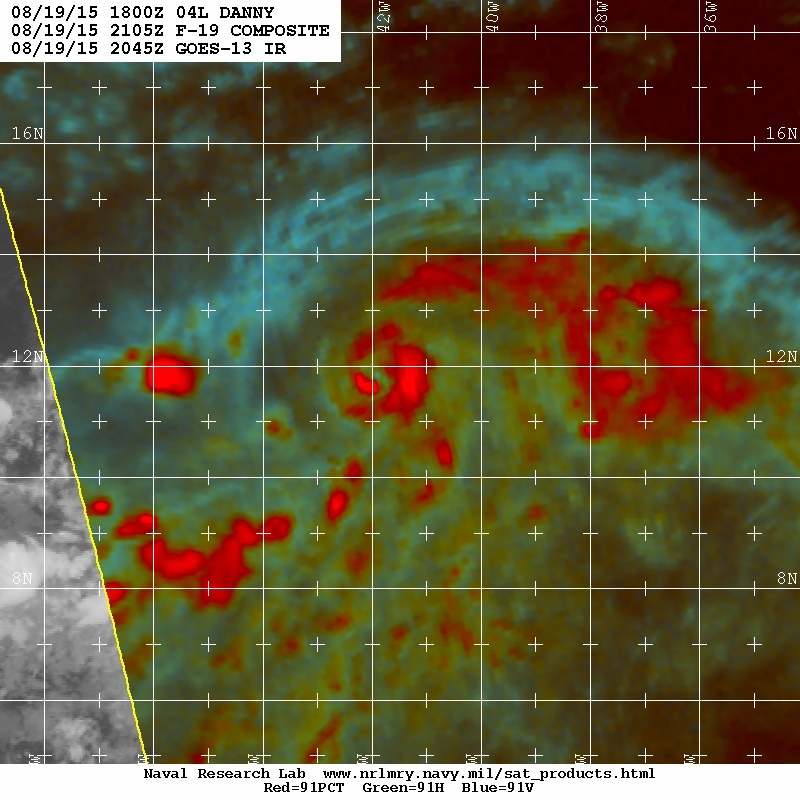 Microwave imagery late this afternoon revealed that there was basically no damage to Danny’s structure. A well developed warm core still exists with a strong and nearly closed ring of convection with rainfall rates of an estimated 3/4″/hr. One could expect that this will close off and intensification will resume. Danny has bounced most of the drier air with the exception of on the south-southeastern side as evidenced by a flat edge in the building central dense overcast, which is representative of dry air. The area to the SE of Danny has moistened a tad, but we may be seeing some signs that Danny is moving away from the monsoonal envelope. Recent IR has shown a temporary smaller area of warmer cloud top temps, which could suggest strengthening is already occurring. Satellite intensity estimates have also increased. A 20z windsat pass also showed that a small subsidence area may exist below the CDO. Danny will likely have a few of burps over the next five days as dry air tries to impede growth especially toward the end of that time frame. As the middle-troposphere cools overnight, we should see an upward phase in convection, if only temporarily. Conditions in the next 24 hours ahead will be the best Danny will see for at least the forseeable future. Although minor cooling may take place at the sea surface ahead of Danny, temperatures to depth may increase. GFS/SHIPS/EURO continues to show shear staying away for the most part until Friday or Saturday, and SHIPS is rather optimistic with keeping shear down below 10 kts until early next week. As shown on the 00z GFS last night, it could possibly drive drier more continental air south into the already massive of pocket of dry air coming from Africa. A secondary possibility is that it could limit the westward expanse of the wedge of high pressure and open up a weakness for down the road as this system moves through or north of the Caribbean. This would not be realized until well beyond 5 days. Minor bouts of weakening are possible especially over the next 18-24 hours as shown in the intensity models and as Danny gets closer to the Caribbean. The trend should still be toward gradual strengthening. With the most recent dry splotch, the rapid intensification chances are considerably lower. This more gradual trend will likely knock out the “S” turn we’ve talked about for a couple of days. The track trend overall has been westward with each synoptic time with the exception of turns to the right, but the variation in track solutions has decreased and thus confidence is lower. NHC remains on the southern side of the track model envelope. A weaker storm will be farther west. This could be a good trend for the islands in terms of rainfall if this thing stays or gets weaker. The overall thinking is that the weaker ridge to the north will allow Danny to slow down for the next day or so before faster trades accelerate Danny to the WNW. By the time Danny gets to 53-56°W, it should be accelerating, but it should also be feeling the effects of shear and drier air. 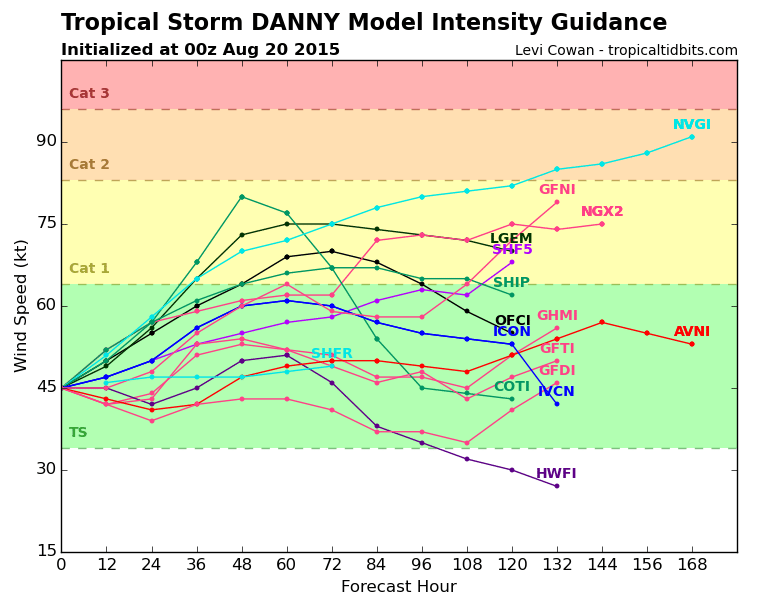 This combination of environmental factors may keep Danny from becoming a hurricane or limit its time as a hurricane. 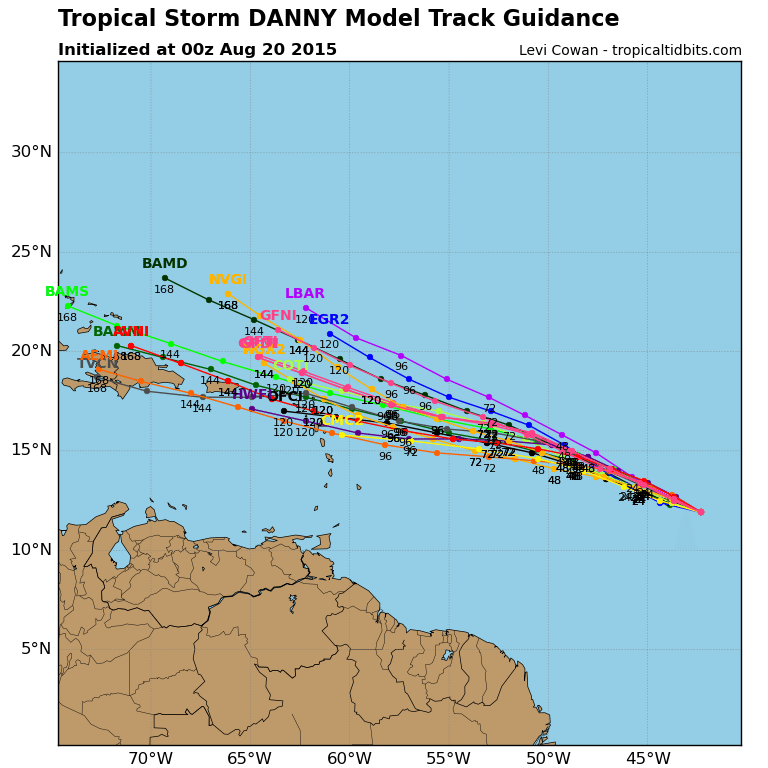 Considerable uncertainty remains in the intensity of Danny. Interesting that there is a general trend past Tuesday for strengthening with better conditions at that time. Slow intensification over the next few days is probable at this time, but hiccups are possible as well. Chances are low at this time that winds of 40 mph and above will impact most of the islands. Chances will increase some. Our certainty will increase on Friday and Saturday when NOAA flies both environmental flights and low level flights respectively from Barbados. Interestingly enough recon will also be flying near Hawaii at the end of this week at the opposite end of the US flight area. Chances that winds of 40 mph or greater within 5 days. Thanks to Tropical Tidbits and the other variety of sources for their graphics. As always, you should use http://www.hurricanes.gov for all official information, especially if you are making decisions. Stay tuned to your local weather forecast office for more information. Posted on Wednesday, August 19th, 2015, in Tropical Weather and tagged Atlantic, Caribbean, Danny, Hurricane, Tropical Storm, Tropics. Bookmark the permalink. Leave a comment.